The 42-year-old actress was joined at the Michael Kors sponsored event by Neil Patrick Harris and his hubby David Burtka, The Deuce‘s Alysia Reiner, and models Karen Elson, Hilary Rhoda, Devon Windsor, Alton Mason, and Alexandra Richards. Also in attendance were Vanessa Williams, DJ Soo Joo Park, Mia Moretti, Project Runway judge Nina Garcia, photographer Nigel Barker and wife Cristen, and designer Stacy Bennett. FYI: Diane, Karen and Alton are all wearing Michael Kors. 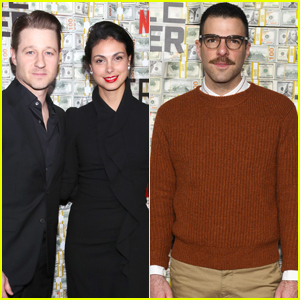 Ben McKenzie and wife Morena Baccarin couple up on the red carpet at the Triple Frontier premiere on Sunday night (March 3) at Lincoln Center in New York City. The couple stepped out in coordinating, all-black outfits as they attended the premiere of the new Netflix movie. Other stars at the premiere included Zachary Quinto, Keegan-Michael Key and wife Elisa Key, Orange is the New Black‘s Alysia Reiner, Father of the Bride‘s Kimberly Williams-Paisley, and How I Met Your Mother‘s Ashley Williams. Triple Frontier hits Netflix on March 15 – watch the trailer here! FYI: Zachary is wearing Oliver Peoples glasses. Christina Hendricks and Alysia Reiner are dishing on their new movie Egg! The 43-year-old Good Girls actress and the 48-year-old Orange Is the New Black star talked about their comedy flick while stopping by Build Series on Friday (January 25) in New York City. In Egg, when conceptual artist Tina (Alysia) introduces her eight-month pregnant art school rival (Christina) to her non-traditional surrogate Kiki (Anna Camp), the truth outs and the patriarchy fights to hang on. Watch the videos from their appearance below! FYI: Christina is wearing Schutz shoes and a Kate Spade New York purse. Katie Holmes & Courteney Cox Support Female Filmmakers at Tribeca Chanel Luncheon! Katie Holmes and Courteney Cox meet up while attending the Through Her Lens – The Tribeca Chanel Women’s Filmmaker Luncheon event on Tuesday (October 16) at Locanda Verde in New York City. Through Her Lens: The Tribeca Chanel Women’s Filmmaker Program is a multi-faceted program that provides funding, meaningful project support, and significant mentorship for up-and-coming US-based female writers and directors. More stars who attended the luncheon event included Piper Perabo, Zosia Mamet, Robin Roberts, Julia Goldani Telles, Adepero Oduye, Deborra Lee Furness, and Orange Is the New Black‘s Uzo Aduba, Samira Wiley, and Alysia Reiner. 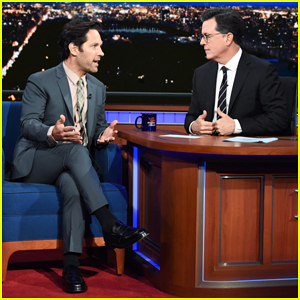 Paul Rudd dished all about trying to get into shape now that he’s part of the Marvel family while making an appearance on The Late Show with Stephen Colbert on Wednesday night (June 27). “It’s part of the thing, you have to somehow fit into the suit. The good thing about an ant is that they’re not Thor-sized, they’re Thorax-sized,” the 49-year-old Ant-Man and the Wasp star joked. That same evening, Paul joined his co-star Michael Douglas at their Ant-Man and the Wasp premiere after party held at The Water Club Restaurant, where Alysia Reiner and Brandon Victor Dixon also showed their support. The Cinema Society with Synchrony and Avion hosted, and guests drank Avion tequila cocktails named Quantum Realm, Ant-idote, and Wasp’s Potion, in keeping with the film. FYI: Alysia is wearing Gemfields x Muse earrings by Begüm Khan.